The rules of fire safety apply to everyone. From toddlers to adults, it’s important for all of us to practice fire prevention on a daily basis. Unfortunately, accidents do happen – it’s our responsibility to prepare for them. When’s the last time you took an inventory of your fire safety equipment? Is every smoke detector in working order? Have you swept out the fireplace recently or hired a professional chimney cleaning service to do some maintenance work? If you want to protect your household, you have to take the extra time to tie up the loose ends. 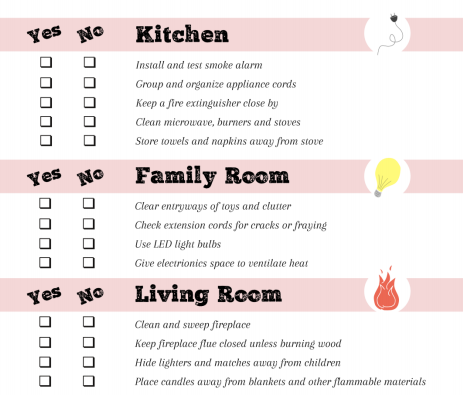 To help you along the way, we’ve created a printable fire safety checklist. With a pen and paper, take a few minutes to run down the list. After putting a check beside every item you’ve completed, look for the trouble spots you missed. Once you’ve sorted them out, think about what you need to do to correct the situation. Don’t own a fire extinguisher? Most home improvement stores have an assortment of options in stock. Always check the expiration date, and keep the extinguisher in a safe, convenient place like a broom closet or cabinet. When your fire alarm sounds, the fire extinguisher should be close at hand so that you can respond quickly. Looking for LED bulbs? Any online retailer or big box store should offer LED bulbs at a reasonable price. They may be slightly more expensive than incandescent bulbs, but the initial price tag doesn’t reflect how much you’ll save on energy costs and how much you’ll improve your fire safety – for home or for office applications. Can’t close your fireplace flue? Every fireplace is different, but most are built with a chain or lever on the inside that allows you to open or close the flue. Cover your mouth, prepare to get a little dirty, and always turn off the gas before you get started. Putting together a first aid kit? Start with the basics: adhesive strips, bandages and cold packs should be available at any local drugstore. You may have to go online or visit a specialty outlet to find a quality fire blanket or burn cream. Keep the kit in your bathroom, and feel free to customize it according to your household. Depending on your health and interests, aloe gel may be more useful than a set of tweezers – or vice versa. You can’t underestimate the importance of fire safety. For homeowners, fire ranks right up there alongside burglary and carbon monoxide as a top security concern. Public agencies are quick to present scary statistics to frame the likelihood of a house fire, but fire safety is about much more than numbers or percentages. Your household is your most treasured possession – is there anything more important than keeping it safe from a very preventable danger?